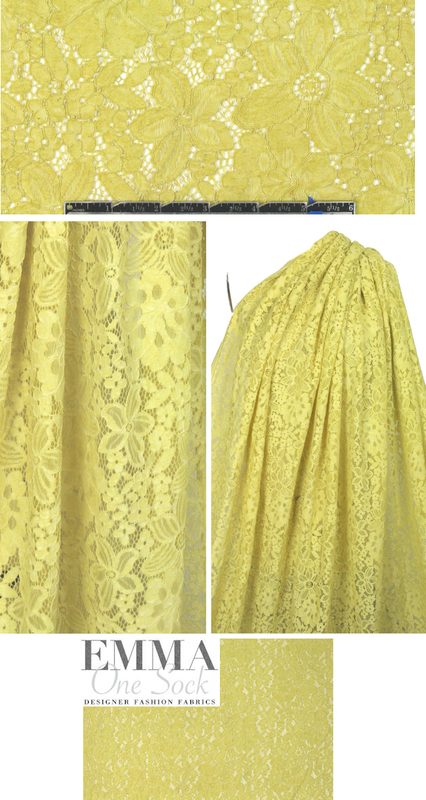 This gorgeous vintage yellow-toned cotton blend lace (PANTONE 13-0720) has an elegant floral design (photographed on a white background) and is reembroidered for extra texture and dimension. The drape is soft with some body, no stretch, and the pattern goes all the way out to the banded selvedges. Use for any project calling for lace: tops, tunics, dresses, skirts, etc. Some styles will need lining or layering. Hand-washing recommended by the manufacturer.